LONDON, 2017-Apr-27 — /Travel PR News/ — British Airways today unveiled details of its multi-million pound re-design for New York JFK Terminal 7, the airline’s flagship US airport. New CGI images give customers a first glimpse of what the terminal will look like following a more than £52 million ($65 million) investment, which will transform the airport experience for the thousands of customers that use it each week. The New York airport modernisation project follows a series of recent investment announcements by the airline, including a £400 million upgrade to Club World, the introduction of Club Europe cabins on domestic flights, new world-class lounge refurbishments, a new First Wing at Heathrow Terminal 5 in London, as well as latest generation WiFi on long-haul and short-haul fleets, self-service check-in and biometric boarding gates to speed up the airport journey. 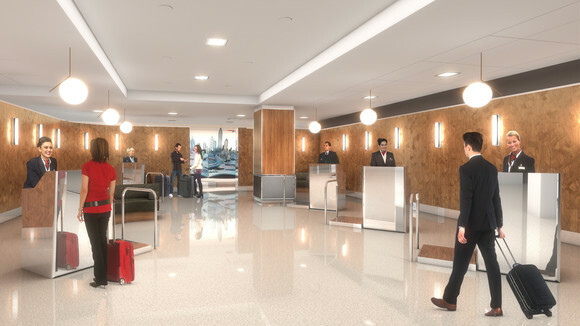 The redesign at JFK will be complete at the end of 2018, revealing a spacious, modern new check-in concourse with a separate Club World and First area, designed with customer privacy in mind. The intimate space will draw inspiration from The First Wing which recently opened at Heathrow Terminal 5 and the new premium check-in area at Gatwick’s South Terminal. Business class, First customers and Gold and Silver Executive Club card holders will benefit from completely regenerated lounges with more space and restaurant-style pre-flight dining. The Concorde Room, which is available for First customers, will also undergo a refresh. Abigail Comber, British Airways’ head of customer, said: “We are currently working behind-the-scenes with top architects and designers to create a beautiful new space for our customers to relax, dine and work in before they take off. The new environment at Terminal 7 is designed for our customers to enjoy a smoother, faster and more relaxed airport experience. This will involve significantly increasing the number of people we can seat for in-flight dining, re-styling the space and adding new lighting, bars and furniture. Customers in all cabins will be able to enjoy a range of cuisines and refreshments at Terminal 7, inspired by New York’s eclectic street food scene. Classic American comfort food including burgers and gourmet sandwiches using premium ingredients will be served along with Japanese dishes made to order. An enhanced, spacious check-in area for a fast, efficient customer journey. An exclusive new premium check-in zone with fast-track security lane. Redesigned and updated lounges with more space to relax, dine, and work. The introduction of an authentic New York culinary experience with local food and beverage concepts to satisfy a variety of tastes. An immersive retail environment for duty free shopping and concessions. New gate seating areas with additional power outlets, designed for customer comfort and convenience. British Airways operates up to 20 flights a day between three London airports (Heathrow, Gatwick and London City) and New York, serving more than 100,000 customers a month. Return fares from London to New York start from £398 per person. This entry was posted in Airlines, Airports, Travel, Travel Services, Travelers and tagged Abigail Comber, British Airways, JFK. Bookmark the permalink.